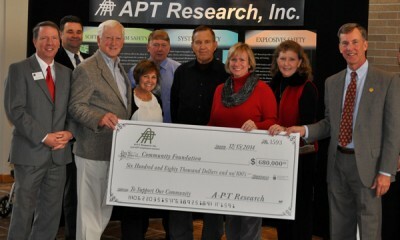 On November 19, 2014, A-P-T Research, Inc. (“APT”) completed a transaction by which they became a 100% employee-owned company through their Employee Stock Ownership Plan (ESOP). This ESOP transaction created significant capital gains for many of the participating shareholders. Working with the Community Foundation, employees were given the option to donate appreciated shares with low-cost basis to the Community Foundation, which provided them with significant tax advantages while providing them an opportunity to support the community through philanthropy. “We are proud that our employees continue the tradition of giving back to our community that APT has fostered for many years. Eleven of our employee shareholders have committed over $680K to charity in various forms, and the Community Foundation helped us devise the most flexible and tax-efficient means for us to make these charitable gifts,” stated APT President Tom Pfitzer. Our Mission: The Community Foundation of Huntsville/Madison County serves as the trustee of our community’s future, fostering philanthropy and mobilizing partners, while striving for an exceptional quality of life both today and tomorrow. The Community Foundation, now in its sixth year of operation, has raised or managed over $14M in charitable donations since inception, and has distributed over $3.6M to nonprofit agencies, churches and schools in our community and elsewhere. The foundation also provides educational, networking and capacity-building services for the nonprofit organizations that benefit from our donors grants. For more information about the Community Foundation, the Community Catalyst Fund, or other giving programs available, contact Stuart Obermann at 256.535.2065 or stuart@communityfoundationhsv.org or visit www.communityfoundationhsv.org. APT is an engineering services company with employees who combine excellence in their disciplines with enthusiasm, versatility, and willingness to “pitch in” wherever needed to support customers, and to perform the many functions of a small company. Employees share ownership in the company and participate in corporate planning and operation. We are both motivated and empowered to provide optimum, flexible support to customers. Since APT’s incorporation in June 1990, the officers have carefully and deliberately built the company’s strong technical and administrative infrastructure. Experienced engineers have been chosen to lead project areas, policies and procedures have been developed to address the diverse aspects of contracting and administration, and support personnel have been selected to fill specialty roles. APT proudly continues to provide top-quality services to satisfied and loyal customers. on Friday, 21 November 2014.